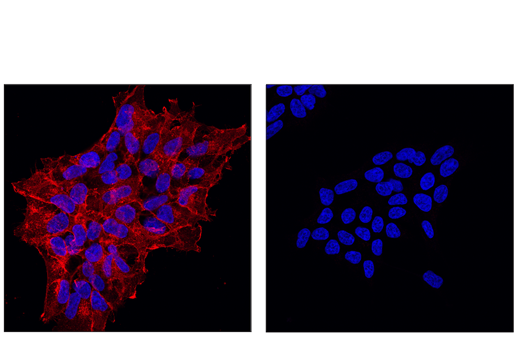 Confocal immunofluorescent analysis of 293 cells stably expressing Myc-tagged ADORA2A (left) versus wild-type 293 cells (right) using Myc-Tag (71D10) Rabbit mAb (Alexa Fluor® 647 Conjugate) (red). Samples were mounted in ProLong® Gold Antifade Reagent with DAPI #8961 (blue). Flow cytometric analysis of 293T cells, mock-transfected (blue) or transfected with a construct expressing Myc-Tag (green), using Myc-Tag (71D10) Rabbit mAb (Alexa Fluor® 647 Conjugate) (solid lines) or concentration-matched Rabbit (DA1E) mAb IgG XP® Isotype Control (Alexa Fluor® 647 Conjugate) #2985 (dashed lines). 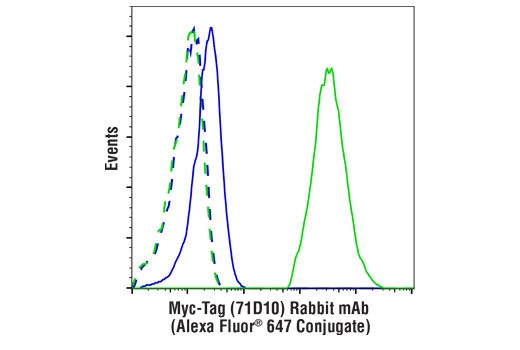 Myc-Tag (71D10) Rabbit mAb (Alexa Fluor® 647 Conjugate) detects recombinant proteins containing the Myc epitope tag. The antibody recognizes the Myc-tag fused to either the amino or carboxy terminus of targeted proteins in transfected cells. Monoclonal antibody is produced by immunizing animals with a synthetic peptide corresponding to residues 410-419 of human c-Myc (EQKLISEEDL).